Rag and Bone Bin commissioned by Turner Contemporary in 2007, is a distorted depiction of Beatrix Potter’s famous childhood character Mr. Brock. 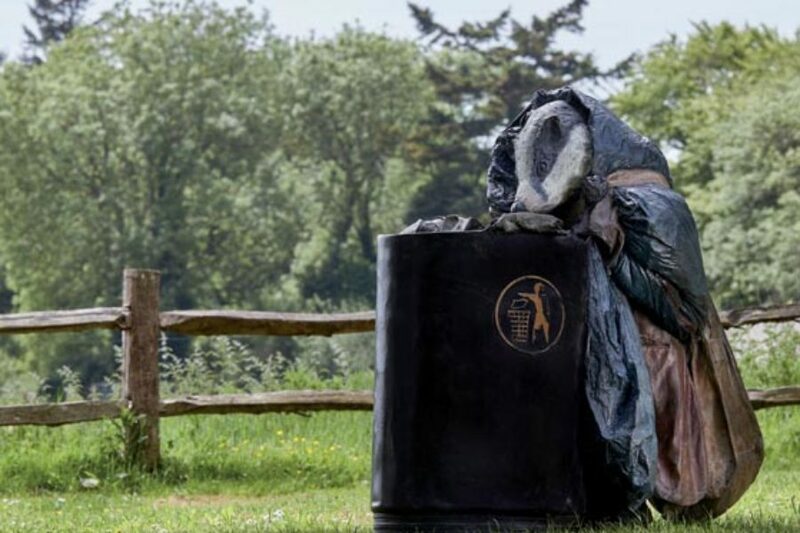 Enveloped in an old sleeping bag this familiar badger is street-worn and squalid, seen rifling through a bin looking for edible waste to sustain his homeless existence. There is of course a humorous irony in the disenchanting of this childhood figure but there is also an arresting sadness surrounding the character’s demise. Cass Sculpture Foundation is a not-for-profit organization that inspires, enables and shares contemporary sculpture. It was founded in 1992 by Wilfred and Jeannette Cass in order to champion exceptional talent within contemporary art, and provide artists with unexampled commissioning and exhibition opportunity. CASS supports its commissioned artists at every step of the process, from conception to fabrication, exhibition and sale.